We would like to acknowledge that Talus Lodge is within Ktunaxa ʔamakʔis, the homeland of the Ktunaxa people. 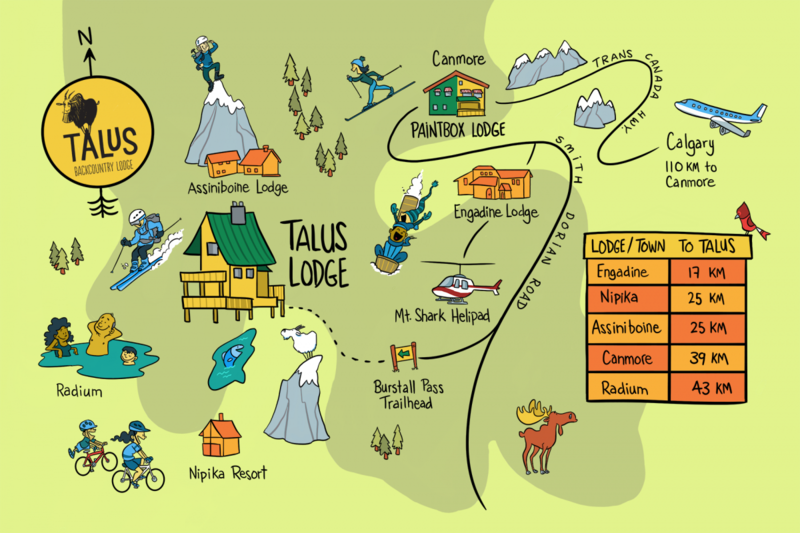 Talus Backcountry Lodge is located in British Columbia, in the East Kootenays, in the heart of the Canadian Rockies. Perched on the Continental Great Divide, Talus is located at 2300 meters of elevation. Our closest neighbors are wild residents of Banff National Park 3 km away. As the crow flies, Brother Andre is 25 km to the north at Assiniboine, the fine folks at Nipika are 25 km westwardly and Engadine Lodge is keeping it classy 17 km to the east. We are in good company! The closest town and our staging area is the fine town of Canmore, Alberta. Canmore is just over an hour away from the Calgary International Airport (YYC). Currently, Talus is accessible only by helicopter from Canmore Municipal Heliport and Mount Shark Helipad. Talus is transitioning to hiking and skiing access via Burstall Pass in 2020. We will be offering ACMG guided ski touring and guided hiking for strong backcountry skiers and hikers. For safety reasons, we do not allow guest access in the summer or winter without a Talus guide. There is avalanche risk, convoluted terrain which requires expert navigation, no marked trails and many other risks associated with travel through remote wilderness. Talus Lodge is nestled in the larch trees on a rocky plateau. There are eight lakes at our front door. One pocket glacier. Soaring peaks. And a world of yahooo! Access to Talus Lodge is via helicopter, with flights from Canmore Municipal Heliport and the Mount Shark Helipad on Thursdays and Mondays. We recommend staying in Canmore at our sister property, the Paintbox Lodge, the day before your trip to Talus and booking commercial flights the day after leaving Talus. Talus Lodge guests receive 10% off at the Paintbox Lodge and we will waive the two night minimum. For more information on baggage, loading and unloading procedures, please view our Helicopter Procedures.